USTET - Mathematics, Science, Reading Comprehension and a seemingly IQ Test. To have an access to these e-learning reviewers, you just have to click the Facebook LIKE button above (if you have not liked it yet). 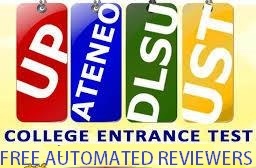 Note: If the reviewers are assigned to you by your teacher (or school), 'print screen' and print your score/result after taking this exam/reviewer, and submit it to your school authority.